Без подсветки, с боковой отсройкой от параллакса, 30 мм, матовый. Выходной зрачок оптимизирован для широкого спектра оружия для оперативно- тактических целей. We pushed everything to the limit to make the VX®-3 at home on your favorite rifle, whether you are hunting whitetail from a treestand, or stalking sheep in rugged terrain. We've loaded the VX-3 with optical technology: Xtended Twilight Lens System, DiamondCoat 2 lens coating, blackened lens edges, second generation waterproofing, twin bias spring erector system, and cryogenically treated adjustments. It's all there to help you make the shots of a lifetime. The Xtended Twilight Lens System™ optimizes the transmission of low-light wavelengths, so you see the details of low-light scenes in greater, brighter detail than with any other riflescope available. DiamondCoat 2™ lens coatings on exterior lens surfaces provide the highest level of scratch resistance Leupold has ever offered. Blackened lens edges reduce light diffusion, so more usable light reaches the shooter’s eye, for a brighter image with increased contrast. Most VX-3 models available with the Leupold® Ballistics Aiming System™ for more accurate long-range shooting. Leupold offers the widest variety of factory standard reticles available, see specifications for model specific options. Even more reticle options available through the Leupold Custom Shop. Finger-adjustable, cryogenically treated, ¼-MOA click windage and elevation adjustments with resettable pointer dials marking the zero point. Internally threaded, lockable, extreme fast-focus eyepiece with Alumina rubber eyepiece guard. Most VX-3 models available in matte black, silver, or gun metal gray finishes. See specifications for model specific details. Illuminated models featuring our all-new, third-generation illumination will keep you on target like never before. We’ve boosted performance with a 15 percent brighter reticle, 8 different intensity settings, an innovative motion sensor, integrated battery storage, and a redesigned, user-friendly interface. 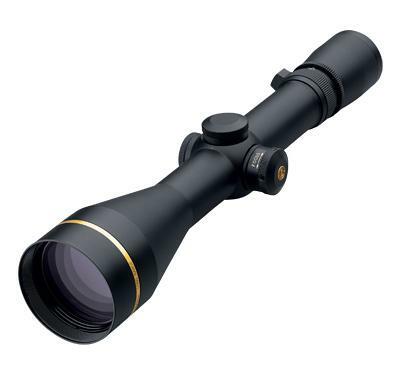 A durable Leupold Scope Cover is included to protect your valuable VX-3 riflescope during transport or when not in use. Incredibly rugged, with absolute waterproof integrity using Leupold's proprietary Argon/Krypton gas blend. As a final touch to the VX-3, Leupold mounts a 24k gold-plated ring and medallion to each scope.